Byo - doing his sponsors, the Nunholm Card School, proud. Two Dumfries century makers were not enough to guide their respective sides to victory last Saturday. 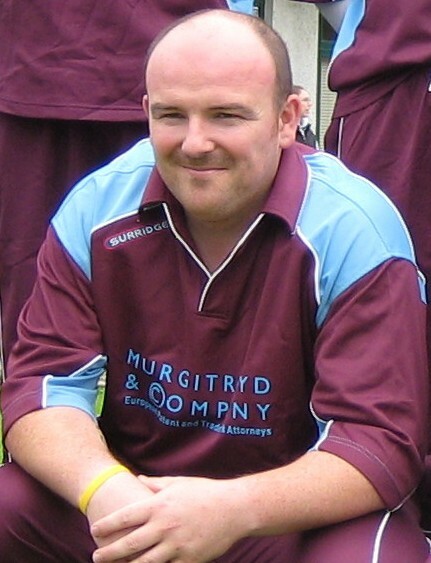 Stuart Corbett-Byers played one of the best innings seen for the club as he hit his second consecutive century with 103 for second placed APD Dumfries at leaders Falkland in National League Division 2. However that wasn’t enough in the run chase and the side fell short of the winning target of 258 by 15 runs. Jim Patterson produced a miserly opening bowling spell and Chris Bellwood and Alan Davidson each chipped in with two wickets. However from 88 for 2 after 30 overs the Falkland batsmen punished anything short or full pitched on a good wicket to amass 257 for 7 twenty overs later with their professional, Thakkar, top scoring with 87. In comparison, after 30 overs of their innings Dumfries were well positioned on 142 for 2 but Geary was then out for a fine 48 and Corbett-Byers followed just short of the two hundred mark. Sixty plus runs in the last ten overs proved too much for the remaining batsmen against the left-arm spin of Singh and the side were all out in the final over. This weekend they play Prestwick at home in the league on Saturday and then away in the Scottish Cup on Sunday. Russell Johnston hoped he had done enough with a sparkling innings of 144 for JMS Nunholm at home against Bothwell in Western Union Division 2 which was instrumental in the side reaching 287 for 4. However, despite an excellent 15 over spell of 3 for 50 from Chris McCutcheon, he was the only bowler to really test the opposition batsmen and Makwane with another century swept his side to victory with one over to spare. However runs on Sunday did mean a win in the Strathclyde Sunday league away at Greenock. Farries with 95 not out and Richardson with 47 saw their side to 233 for 3 off 40 overs. Three wickets from Andrew Forsyth and a good all-round fielding and bowling display saw one mix of youth and experience beat another by 83 runs. Also on Sunday the winners of the DG U13 League were Dumfries Injuns who overcame Langholm/Lockerbie Thunder thanks in particular to a fifty from Chris Lumb and runs and wickets from Chris McBride and Michael Temlett.